When dealing with any form of neurodevelopmental disease, disorder, or dysfunction, my colleagues and I have found it helpful to describe in detail its content and then to hazard guesses regarding its developmental dynamics. Then, we attempt to outline the neurodevelopmental dynamics involved. Finally, we attempt to offer a model /theory that encompasses the content and dynamics and suggests heuristic avenues to pursue in theory confirmation/disconfirmation and enhancement. This section will focus on content and dynamics. Later sections will include considerations regarding model building and theory development. The content of the NLD syndrome is virtually equivalent to its phenotypical presentation. This is important to bear in mind because an attempt to make a case for the syndrome of NLD as representing the ï¿½final common pathwayï¿½ of a fairly large number of neuropathological conditions will be put forward in subsequent sections. Speculation regarding the content of the NLD syndrome began with the seminal work of Myklebust (e.g., 1975). What we have been able to do is to flesh out this content, mostly as a result of our study of subtypes of LD. We have approached this investigative effort from the perspective of developmental neuropsychology: that is, the study of brain-behavior relationships within a developmental context. A review of these studies is available elsewhere (Rourke, 1989; 1995). For our current purposes, the relevant dimensions of the conclusions of these investigations are what we take to be the content and dynamics of NLD. Figure 1 contains a summary of the content and dynamics of NLD. The content is summarized in the boxes. 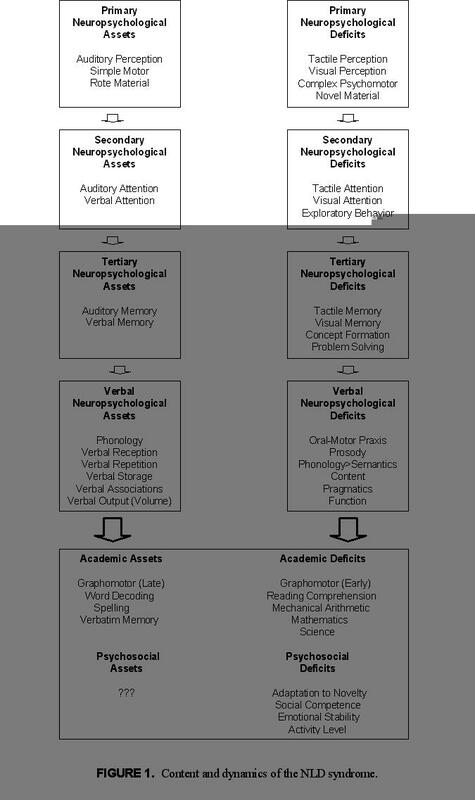 Note that the neuropsychological assets are outlined in the left column, and the neuropsychological deficits in the right column. The designations of primary, secondary, and so on will be addressed in the next section. We begin with a description of the characteristics of the NLD syndrome, and then move to a brief explanation of the dynamic interactions among and between the various levels of this syndromeï¿½s basic and derivative manifestations. Finally, we turn to a more specific discussion of these dynamics. 1. Because of our focus on children and adolescents, manifestations of NLD in persons within these developmental stages are emphasized. 2. This description is couched in terms of the ï¿½developmentalï¿½ manifestation of the NLD syndrome - that is, in terms of its characteristics in a child who has been so afflicted since his or her earliest developmental stages. Some modifications in the manifestations of the syndrome are necessary when we turn to considerations of the onset of the syndrome in an older child, adolescent, or adult who has enjoyed a normal early developmental course. Simple motor skills. Simple, repetitive motoric skills are generally intact, especially at older age levels (middle childhood and beyond). Auditory perception. After a very early developmental period when such skills appear to be lagging, auditory-perceptual capacities become very well developed. Rote material. Repetition and/or constancy of stimulus input - especially through the auditory modality, but not confined to it - is well appreciated. Repetitious motoric acts, including some aspects of speech and well-practiced skills such as handwriting, eventually develop to average or above-average levels. Attentional skills. Deployment of selective and sustained attention for simple, repetitive verbal material (especially that delivered through the auditory modality) becomes very well developed. Memory. Rote verbal memory and memory for material that is readily coded in a rote verbal fashion becomes extremely well developed. Speech and Language. Following an early developmental period when linguistic skills appear to be lagging, a number of such skills emerge and develop in a rapid fashion. These include excellent phonemic hearing, segmentation, blending, and repetition. Very well-developed receptive language skills and rote verbal capacities are evident, as are a large store of rote verbal material and verbal associations, and a very high volume of speech output. All of these characteristics tend to become more prominent with advancing years. Following initial problems with the visual-motor aspects of writing and much practice with a writing instrument, graphomotor skills (for words) reach good to excellent levels. Following initial problems with the development of the visual-spatial feature analysis skills necessary for reading, good to excellent single-word reading skills also develop to above-average levels. Misspellings are almost exclusively of the ï¿½phonetically accurateï¿½ variety: that is, the type seen most often in normal spellers. Verbatim memory for oral and written verbal material can be outstanding in the middle to late elementary school years and thereafter. Tactile perception. Bilateral tactile-perceptual deficits are evident, often more marked on the left side of the body. Deficits in simple tactile imperception and suppression may become less prominent with advancing years, but problems in dealing with complex tactile input tend to persist. Visual perception. There is impaired discrimination and recognition of visual detail and visual relationships, and there are outstanding deficiencies in visual-spatial-organizational skills. Simple visual discrimination, especially for material that is verbalisable, usually approaches normal levels with advancing years. Complex visual-spatial-organizational skills, especially when required within a novel framework, tend to worsen relative to age-based norms. Complex psychomotor skills. Bilateral psychomotor coordination deficiencies are prominent; these are often more marked on the left side of the body. These deficits, except for well-practiced skills such as handwriting, tend to increase in severity with age, especially when they are required within a novel framework. Novel material. As long as stimulus configurations remain novel, they are dealt with very poorly and inappropriately. Difficulties in age-appropriate accommodation to, and a marked tendency toward over-assimilation of, novel events increase with advancing years. There is an over-reliance on prosaic, rote (and in consequence, inappropriate) behaviors in such situations. The capacity to deal with novel experiences often remains poor and may even worsen with age. Attention. Attention to tactile and visual input is poor. Relative deficiencies in visual attention tend to increase over the course of development, except for material that is programmatic and over-learned (e.g., printed text). Deployment of selective and sustained attention is much better for simple, repetitive verbal material (especially that delivered though the auditory modality) than for complex, novel nonverbal material (especially that delivered through the visual or tactile modalities). The disparity between attentional deployment capacities for these two sets of materials tends to increase with age. Exploratory behavior. During early phases of development, there is little physical exploration of any kind. This is the case even for objects that are immediately within reach and could be explored through visual or tactile means. A tendency toward sedentary and physically limited modes of functioning tends to increase with age. Memory. Memory for tactile and visual input is poor. Relative deficiencies in these areas tend to increase over the course of development, except for material that is programmatic and overlearned (e.g., spoken natural language). Memory for nonverbal material, whether presented through the auditory, visual, or tactile modalities, is poor if such material is not readily coded in a verbal fashion. Relatively poor memory for complex, meaningful, and/or novel verbal and nonverbal material is typical. Differences between good to excellent memory for rote material and impaired memory for complex material and/or that which is not readily coded in a verbal fashion tend to increase with age. Concept-formation, problem-solving, strategy-generation, and hypothesis-testing/appreciation of informational feedback. Marked deficits in all of these areas are apparent, especially when the concept to be formed, the problem to be solved, and/or the problem-solving milieu(x) is/are novel or complex. Also evident are significant difficulties in dealing with cause-and-effect relationships and marked deficiencies in the appreciation of incongruities (e.g., age-appropriate sensitivity to humor). Most noticeable when formal operational thought becomes a developmental demand (i.e., in late childhood and early adolescence), relative deficits in these areas tend to increase markedly with advancing years, as is evident in the often widening gap between performance on rote (overlearned) and novel tasks. Speech and language. Mildly deficient oral-motor praxis, little or no speech prosody, and much verbosity of a repetitive, straightforward, rote nature are characteristic. When paraphasic errors are in evidence, these are much more likely to be of the phonological than of the semantic variety. Also typical are content disorders of language, characterized by very poor psycholinguistic content and pragmatics (e.g., ï¿½cocktail partyï¿½ speech) and reliance upon language as a principal means for social relating, information gathering, and relief from anxiety. "Memory" for complex verbal material is usually very poor, probably as a result of poor initial comprehension of such material. All of these characteristics, except oral-motor praxis difficulties, tend to become more prominent with advancing years. Graphomotor. In the early school years, there is much difficulty with printing and cursive script; with considerable practice, handwriting often becomes quite good. However, some avoid practice and remain deficient in such skills. Reading comprehension. Reading comprehension is much poorer than single-word reading (decoding). Relative deficits in reading comprehension, especially for novel material, tend to increase with advancing years. Mechanical arithmetic and mathematics. There are outstanding relative deficiencies in mechanical arithmetic as compared to proficiencies in reading (word-recognition) and spelling. With advancing years, the gap between good to excellent single-word reading and spelling and deficient mechanical arithmetic performance widens. Absolute level of mechanical arithmetic performance only rarely exceeds the Grade 5 level; mathematical reasoning, as opposed to programmatic arithmetic calculation, remains poorly developed. Science. Persistent difficulties in academic subjects involving problem-solving and complex concept-formation (e.g., physics) are prominent. Problems in dealing with scientific concepts and theories become apparent by early adolescence. The gap between deficiencies in this type of complex academic endeavor and other, more rote, programmatic academic pursuits widens with age. Adaptation in novel situations. There is extreme difficulty in adapting to (i.e., countenancing, organizing, analyzing, and synthesizing) novel and otherwise complex situations. An over-reliance on prosaic, rote (and, in consequence, inappropriate) behaviors in such situations is common. These characteristics tend to become more prominent and problematic with advancing years. Social competence. Significant deficits are apparent in social perception, social judgment, and social interaction skills; these deficits become more prominent and problematic as age increases. There is a marked tendency toward social withdrawal and even social isolation with advancing years. Psychosocial disturbance. Often characterized during early childhood as afflicted with some type of acting-out or other "externalized" disorder, such children are very much at risk for the development of ï¿½internalizedï¿½ forms of psychopathology. Indications of excessive anxiety, depression, and associated internalized forms of psychosocial disturbance tend to increase with advancing years. Activity level. Children who exhibit the syndrome are frequently perceived as hyperactive during early childhood. With advancing years, they tend to be characterized as normoactive and eventually hypoactive. This summary of the assets and deficits of the NLD syndrome should be viewed within a specific context of cause-and-effect relationships; that is, the basic neuropsychological assets and deficits are thought to lead to the secondary neuropsychological assets and deficits, and so on, within the four categories of neuropsychological dimensions. Moreover, these assets and deficits are seen as causative vis-ï¿½-vis the academic and psychosocial aspects of the syndrome. In this sense, the latter dimensions are, essentially, dependent variables (i.e., effects rather than causes) in the NLD syndrome. Figure 1 may be of some assistance in understanding the dynamics that are hypothesized to obtain in the NLD model. It is proposed in the model that the principal or primary dimensions of the NLD syndrome are deficits in visual-perceptual-organizational abilities, complex psychomotor skills, and tactile perception, in addition to difficulties in dealing with novelty. Primary assets include proficiency in most rote verbal and some simple motor and psychomotor skills (Rourke, 1989). We and other practitioners arrived at these formulations on the basis of clinical observations. Confirmation of these dimensions as primary arises from the results of some studies in our laboratory (e.g., Casey, Rourke, & Picard, 1991; Harnadek & Rourke, 1994). It should be emphasized that, in the Rourke (1988a,1989, 1995a) models, the patterns of academic and psychosocial deficits experienced by individuals who exhibit NLD are viewed as the direct result of the interaction of the primary, secondary, tertiary, and linguistic neuropsychological assets and deficits that are outlined schematically in Figure 1. For example, considering the hypothesized "deficit" stream, the primary neuropsychological deficits experienced by the child with NLD are seen as having to do with aspects of tactile and visual perception, complex psychomotor skills, and the capacity to deal adaptively with novel material. Such deficits would be expected to eventuate in disordered tactile and visual attention and stunted exploratory behavior; in turn, problems in memory for material delivered through the tactile and visual modalities (Rourke & Tsatsanis, 1995) as well as deficits in concept-formation and problem solving (Fisher, DeLuca, & Rourke, 1997; Strang & Rourke, 1983) would be expected to ensue. This set of deficits would be expected to eventuate in the linguistic deficiencies outlined, especially in the dimensions of psycholinguistic content and pragmatics. See Rourke and Tsatsanis (1996) for a fuller explanation of these linguistic deficits. The academic and psychosocial/adaptive deficiencies listed are the expected sequelae of these neuropsychological deficits (Casey et al., 1991; Rourke, 1993, 1995b; Rourke & Conway, 1997; Rourke & Fuerst, 1995; Rourke & Tsatsanis, 1995; Tsatsanis & Rourke, 2003). It is especially important to note that this set of neuropsychological deficits is expected to lead, in a necessary way, to a particular configuration of problems in psychosocial/adaptive behavior both within and without the academic situation (Rourke, 1988a, 1989, 1995a, 2000; Rourke & Fuerst, 1992; Rourke et al., 2002). As suggested above, reference to Figure 1 should be of some assistance in the understanding of our views regarding the content and dynamics of the NLD syndrome. One very important implication of these views relates to our qualitative analysis of the arithmetic performance and psychosocial behavior of children who exhibit NLD. When so doing (Rourke, 1993, 2000; Rourke & Conway, 1998; Rourke et al., 1990; Rourke & Fuerst, 1995; Strang & Rourke, 1985), we find that the neuropsychological assets and deficits that appear to lie at the root of their social adaptation deficiencies are virtually identical to those that have a negative impact on their performance in mechanical arithmetic. In a word, the maladaptive social behavior of children with NLD is seen as stemming from the very same neuropsychological deficits as do their problems in arithmetic calculation, (e.g., those in visual-perceptual-organizational, psychomotor, and concept-formation skills, and difficulties in dealing with novel problem-solving situations). In a series of investigations (Casey et al., 1991; Harnadek & Rourke, 1994; and see Rourke & Fuerst, 1991 for a summary of several studies), we have been able to demonstrate the concurrent and predictive validity of these formulations relating to the academic and psychosocial consequences of NLD. Also, it has been possible to demonstrate that particular patterns of academic assets and deficits are reliably related to particular patterns of psychosocial dysfunction across the age-span of interest (Fuerst & Rourke, 1995; Tsatsanis, Rourke, & Fuerst, 1997). Thus, this investigative program (Rourke, 1995b) progressed from systematic clinical observations to the formulation of the NLD syndrome and dynamics and, eventually, to empirical tests of hypotheses deduced from the Rourke (1989; 1995a) models. Virtually all results of studies in our own and others' laboratories have been consistent with deductions derived from these neurodevelopmental models designed to encompass and explicate the NLD syndrome and its dynamics. See Rourke et al. (2002) for a summary of these. Health insurance is now deemed to be a necessity due to the continuous increase of health care expenses. Dental insurance helps provide enough coverage for patients who do not want to worry if they can afford having oral procedures in the future. There are a number of insurance companies in Canada that offer dental insurance specifically in Quarry Park. Insurance companies have partnered with several dental clinic Quarry Park has that are offered to individuals, visitors, students and retirees. These dental insurance companies provide benefits ranging from prescription drugs to dental procedures. Dental insurance basically helps cover the costs incurred within the scope of dental health. Dental care is costly for some people which is why it prevents some patients from seeking check-ups or treatments. Regular visits to the dentist also means spending money especially if you are required to have a dental treatment. Dental insurance is similar to medical insurance. You pay for a specific rate which is referred to as a premium and in exchange, you are entitled and provided a list of benefits. However, dental benefits are smaller as compared to medical insurance benefits. In dental insurance, benefits usually include regular check-ups, cleaning, polishing, x-rays, fillings, extractions and other specified services in oral care. There are also a number of plans that offer different coverages. Plans with a higher premium provide entitlements that cover specific dental procedures such as dental implants, oral surgery and other types of orthodontics. Different plans have different costs. It depends on the premium, coverage and how much you need to pay for the services. Having an insurance is a good choice. Even the healthiest person can suddenly contract a disease or medical problem. Itâ€™s the same with dental insurance. You can never predict if you will have dental issues and problems in the future. As the cost of living continue to grow, insurance can protect you from additional costs that may arise. Technically, it is better to purchase a plan before you actually need it. When choosing your dental insurance, you should ask yourself how much will it cost. Find out if the plan you are getting covers what you need. Check the availability of dentists that are participating in your plan. In this regard, visit your local dental clinic Quarry Park offers. You can always choose a plan that will suit your budget yet still cater to your specific needs. There are many companies that offer competitive rates and products. Having an insurance will help you achieve a better overall health plan. Before getting any treatment or procedure, always cross check with your dentist and insurance provider on the coverage, benefits and costs. Since some plans vary when it comes to reimbursements in specific treatments or procedures that is why it is important to sit down and discuss the details. The dental clinic Quarry Park Â is very accommodating when it comes to doctor and patient relationship. Always be transparent with your dentist when it comes to your financial needs. Overall, dental insurance is important as medical insurance. It safeguards our oral health from unforeseen future health problems that may arise, as well as protect us financially from costly procedures. Either way, it is something to think about when planning about your future. Casey, J. E., Rourke, B. P., & Picard, E. M.ï¿½ (1991).ï¿½ Syndrome of nonverbal learning disabilities: Age differences in neuropsychological, academic, and socioemotional functioning.ï¿½ Development and Psychopathology, 3, 331-347. Fisher, N. J., DeLuca, J. W., & Rourke, B. P. (1997).ï¿½ Wisconsin Card Sorting Test and Halstead Category Test performances of children and adolescents who exhibit the syndrome of Nonverbal Learning Disabilities.ï¿½ Child Neuropsychology, 3, 61-70. Fuerst, D. R., & Rourke, B. P. (1993).ï¿½ Psychosocial functioning of children: Relations between personality subtypes and academic achievement.ï¿½ Journal of Abnormal Child Psychology, 21, 597-607. Fuerst, D. R., & Rourke, B. P. (1995).ï¿½ Psychosocial functioning of children with learning disabilities at three age levels.ï¿½ Child Neuropsychology, 1, 38-55. Harnadek, M. C. S., & Rourke, B. P. (1994).ï¿½ Principal identifying features of the syndrome of nonverbal learning disabilities in children.ï¿½ Journal of Learning Disabilities, 27, 144-154. Rourke, B. P. (1987).ï¿½ Syndrome of nonverbal learning disabilities:ï¿½ The final common pathway of white-matter disease/dysfunction?ï¿½ The Clinical Neuropsychologist, 1, 209-234. Rourke, B. P. (1988a).ï¿½ Socio-emotional disturbances of learning-disabled children.ï¿½ Journal of Consulting and Clinical Psychology, 56, 801-810. Rourke, B. P. (1988b).ï¿½ The syndrome of nonverbal learning disabilities:ï¿½ Developmentalï¿½ manifestations in neurological disease, disorder, and dysfunction.ï¿½ The Clinical Neuropsychologist, 2, 293-330. Rourke, B. P. (1989).ï¿½ Nonverbal learning disabilities: The syndrome and the model.ï¿½ New York:ï¿½ Guilford Press. Rourke, B. P. (1993).ï¿½ Arithmetic disabilities, specific and otherwise: A neuropsychological perspective.ï¿½ Journal of Learning Disabilities, 26, 214-226. Rourke, B. P. (1995a).ï¿½ Introduction and overview: The NLD/white matter model.ï¿½ In B. P. Rourke (Ed. ), Syndrome of nonverbal learning disabilities: Neurodevelopmental manifestations (pp. 1-26).ï¿½ New York: Guilford Press. Rourke, B. P. (1995b). The science of practice and the practice of science: The scientist-practitioner model in clinical neuropsychology.ï¿½ï¿½ Canadian Psychology, 36, 259-287. Rourke, B. P. (2000).ï¿½ Neuropsychological and psychosocial subtyping: A review of investigations within the University of Windsor laboratory.ï¿½ Canadian Psychology, 41, 34-50. Rourke, B. P., & Conway, J. A.ï¿½ (1997).ï¿½ Disabilities of arithmetic and mathematical reasoning: Perspectives from neurology and neuropsychology. Journal of Learning Disabilities, 30, 34-46. Rourke, B.P., & Fuerst, D. R. (1991).ï¿½ Learning disabilities and psychosocial functioning: A neuropsychological perspective.ï¿½ New York:ï¿½ Guilford Press. Rourke, B. P., & Fuerst, D. R. (1992).ï¿½ Psychosocial dimensions of learning disability subtypes: Neuropsychological studies in the Windsor Laboratory. School Psychology Review, 21, 360-373. Rourke, B. P., & Fuerst, D. R. (1995).ï¿½ Cognitive processing, academic achievement, and psychosocial functioning: A neuropsychological perspective.ï¿½ In D. Cicchetti & D. Cohen (Eds. ), Developmental psychopathology (Vol. 1, pp. 391-423).ï¿½ New York: Wiley. Rourke, B. P., & Fuerst, D. R. (1996).ï¿½ Psychosocial dimensions of learning disability subtypes.ï¿½ Assessment , 3, 277-290. Rourke, B. P., & Tsatsanis, K. D. (1995).ï¿½ Memory disturbances of children with learning disabilities: A neuropsychological analysis of two academic achievement subtypes.ï¿½ In A. D. Baddeley, B. A. Wilson, & F. N. Watts (Eds. ), Handbook of memory disorders (pp. 501-531). London: Wiley & Sons. Rourke, B. P., & Tsatsanis, K. D. (1996).ï¿½ Syndrome of Nonverbal Learning Disabilities: Psycholinguistic assets and deficits.ï¿½ Topics in Language Disorders, 16, 30-44. Rourke, B. P., van der Vlugt, H., & Rourke, S. B. (2002).ï¿½ Practice of child-clinical neuropsychology: An introduction.ï¿½ Lisse, The Netherlands: Swets & Zeitlinger. Strang, J. D., & Rourke, B. P. (1983).ï¿½ Concept-formation/non-verbal reasoning abilities of children who exhibit specific academic problems with arithmetic.ï¿½ Journal of Clinical Child Psychology, 12, 33-39. Tsatsanis, K. D., Fuerst, D. R., & Rourke, B. P. (1997).ï¿½ Psychosocial dimensions of learning disabilities: External validation and relationship with age and academic functioning. Journal of Learning Disabilities, 30, 490-502. Tsatsanis, K. D., & Rourke, B. P.ï¿½ (2003).ï¿½ Syndrome of Nonverbal Learning Disabilities: Effects on learning.ï¿½ In A. H. Fine & R. Kotkin (Eds,), Therapists guide to learning and attention disorders (pp. 109-145).ï¿½ New York: Academic Press.